Marvel Super-Heroes Megazine #3, Marvel Comics, cover-dated December 1994. What happens when Professor Alan takes on 96 pages of Marvel reprints? How good was the early work of John Byrne and Frank Miller? Can he handle a Fantastic Four story that barely has the team it? And how many LMDs are in the Marvel Universe anyway? ﻿﻿﻿﻿Next Episode: Uncle Scrooge Adventures 20, or a mystery book related to the upcoming network-wide crossover. Hi Professor Alan. I've just recently discovered your Quarter-Bin Podcast and really enjoyed episode #129. 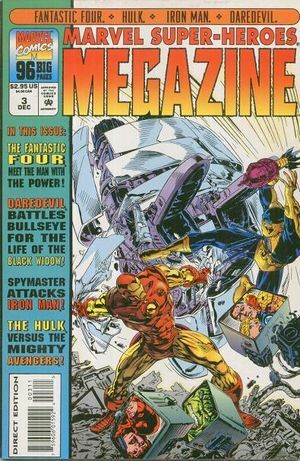 When I went to my local comic shop today and searched through the quarter-bin, I was happy to find a copy of Marvel Super-Heroes Megazine #5. While not the issue you reviewed, I did consider it a fun find. I have plans to listen to more of your podcasts, and will mention it in an upcoming episode of my blog, Cool Comics In My Collection at edgosney.com. Thanks, Ed! If you stay around until ep #149, you'll hear me cover that issue! Glad to have yo on board.